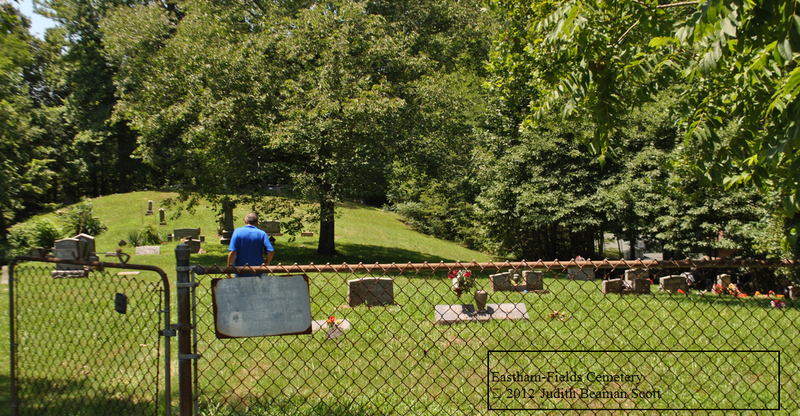 On a recent visit to Boyd County, Kentucky, I visited as I usually do, the Eastham-Fields Cemetery. 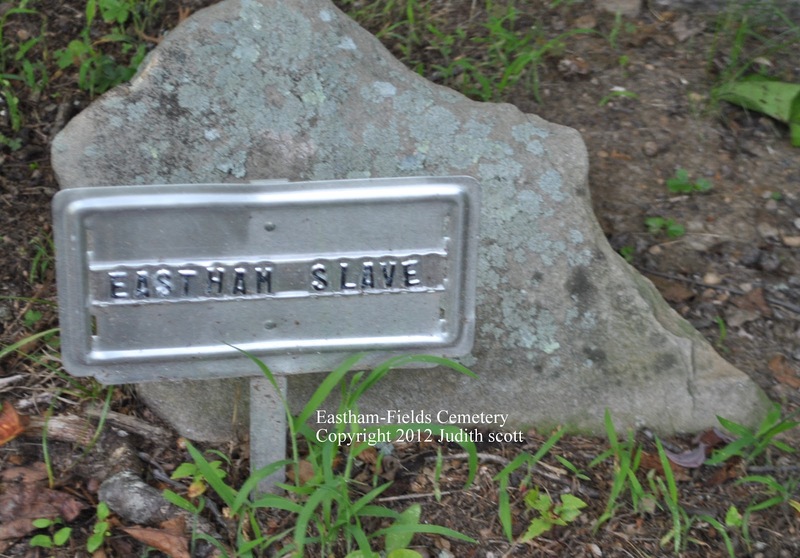 The cemetery is the burial place of Christiana Eastham (1777-1852), wife of Edward (1771-1828), the first family of this line to settle in Kentucky, as well as other family members and associated families. I was alerted to changes last winter, when my sister called me from the cemetery asking if I knew anything about some new markers placed there. 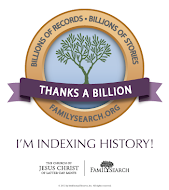 I did not, and as I discovered, neither did many local genealogists. 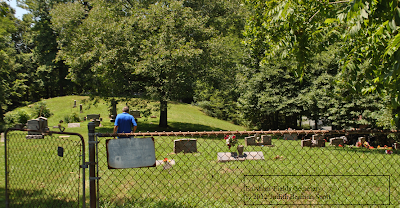 It has long been rumored, as it is with many old cemeteries, that the rocks peeking out of the ground in the old part of the cemetery are the graves of slaves. I don't know of any evidence to support this theory, but neither do I have reason to refute the claim. 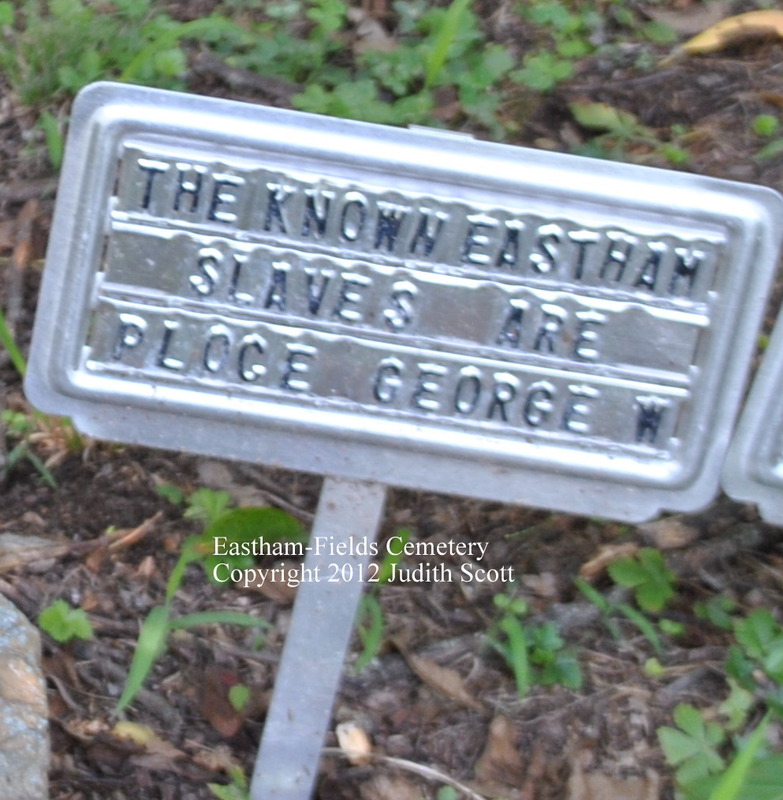 However, even if these are slave graves, no one knows who is buried there. But someone decided to place markers near the protruding rocks, with slave names on them. How did they decide what names to place there? Please understand I have no problem with marking graves in a cemetery, provided of course that you have permission to do so-this is a private cemetery. I do have some concerns about marking a grave as if it were, in fact, the burial place of a particular person, when there is no way of knowing that. Those markers will remain there after we are gone, and some day descendants will visit that cemetery and believe that is the grave of their ancestor. Nathan, James, Margarett, Charles, George. Unfortunately, the names of the slaves listed here belonged to Eastham families that are not represented in this cemetery. 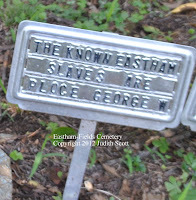 The land where the cemetery is once belonged to Hartwell Chandler Eastham and his wife Isabella McGuire. Hartwell is the son of Edward Eastham and Christiana Chandler, both born in Virginia. Christiana is buried in this cemetery but her husband Edward, who died years before her, is buried in McCormick Cemetery. The crypt at the back of the cemetery is that of the Eastham family. Most of the tombstones are broken or gone. 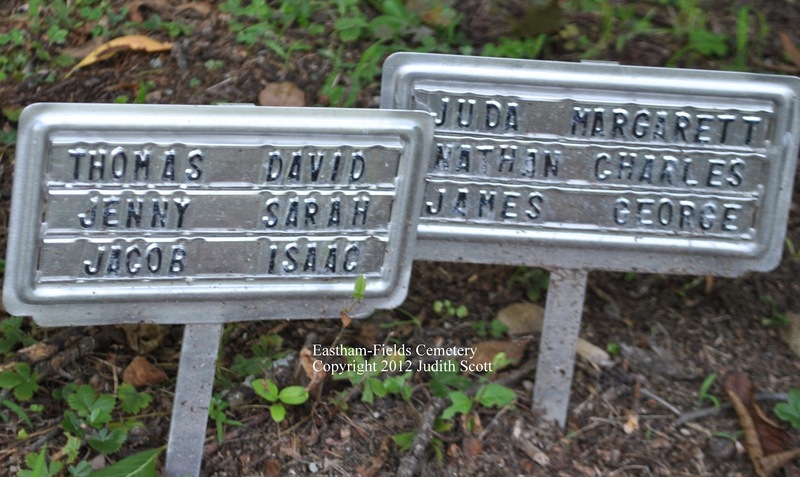 Buried near Christiana are at least three of her children, Hartwell, James T. and Elizabeth. Her daughter Mary Ann Fields and husband James Fields are buried in another area of the cemetery. 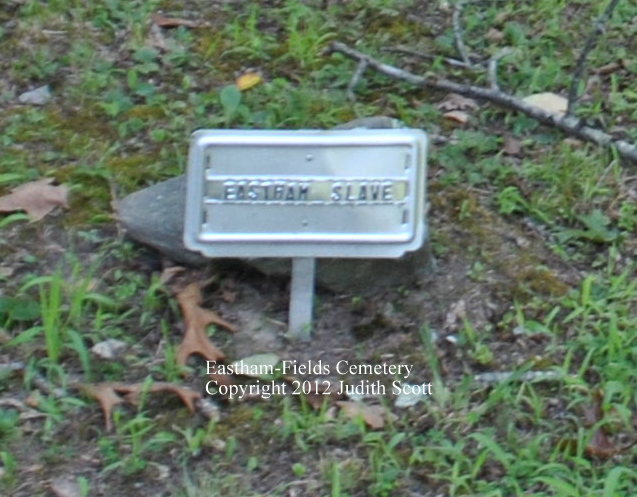 The slave names listed here, for the most part, were not associated with the family members buried in this Eastham cemetery. All the slave names listed are easily located online. 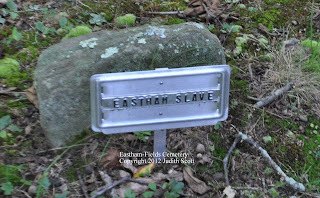 Several names were from a civil suit regarding the estate of another Edward Eastham, this one the son of Edward and Christiana and brother to Hartwell. Several more names are from the 1860 census and can be found at Ancestry.com. 1860 U.S. census, slave schedule, Boyd County, Kentucky, page 2. This may be the Robert W. from above with two slaves listed in the civil suit. This is probably the son of Hartwell and Christiana. This is likely John, the son of Edward and Christiana. John, his wife, and other family members are buried in an another Eastham Cemetery on Trace Creek in Boyd County. Lawrence County: Ploce Eastham - b. April 2, 1857; owner H. E. Eastham; Notes: female, mulatto. A comparison of the list of names from the records above and the list from the cemetery is a match, with the exception of minor spelling changes and the duplication of the two names explained above. 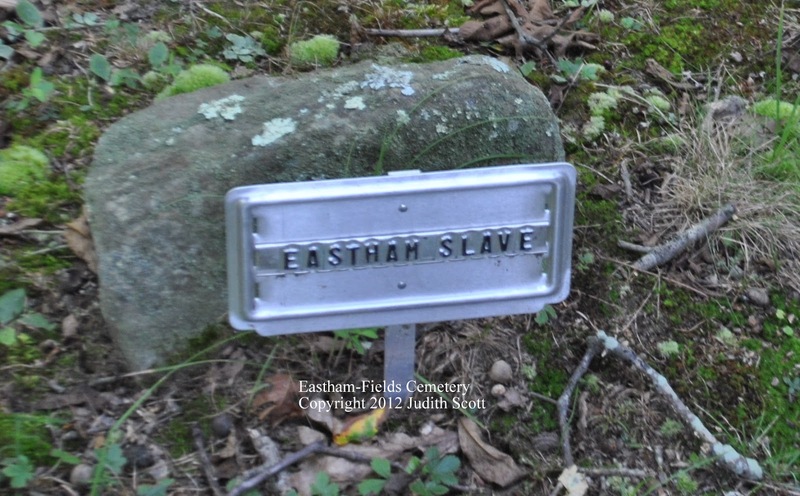 Are there slaves buried in this cemetery? Possibly. 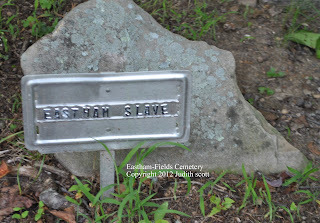 But it is not likely that the graves of the slaves named on the cemetery markers are in this cemetery. 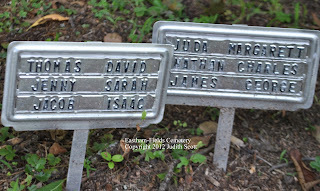 First, the names on the markers were not connected to the people buried in this cemetery. Another important consideration is the dates. These slaves were all alive in 1860 and probably still alive in 1865 when they were legally free. They would not be buried as slaves after that time. Note: Tomorrow, September 22, is the 150th anniversary of Lincoln's preliminary Emancipation Proclamation, a warning to the southern states to end the war and abolish slavery on their own within 100 days, or he would free the slaves himself, although five slave-holding border states, including Kentucky, were not included. Lincoln issued the Emancipation Proclamation on 1 January 1863 which declared all slaves in the rebel state are free. It wasn't until the 13th amendment to the United States Constitution was ratified on 6 December 1865 (without Kentucky) that Kentucky slaves were legally free.